Some books are read simply for pleasure. Let’s call them Baby Bear books. Some books are read primarily for education or information. These would be Papa Bear books. But some books are a pleasure to read while they instruct. Home is a perfectly just-right Mama Bear book. I had great expectations for this book, recommended as it was by George Grant. The first chapter was disappointing, focusing on Ralph Lauren, nostalgia and invented tradition. Beyond chapter one, however, the book was an absorbing and satisfying read. Home is a culture history of comfort. If you have someone in your life interested in architecture, interior design, or just in a comfortable home, this would make a wonderful gift. More quotes from Home from previous blog entries: Interior Space and Privacy. This entry was posted in Uncategorized and tagged bookreview, quotes by alivingpencil. Bookmark the permalink. I enjoyed this book, too. 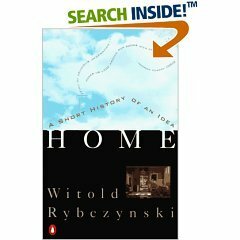 Actually, I’ve enjoyed everything I’ve read by Rybczynski! I especially enjoyed your entry on Interior Space. This books needs to go on my PBW list. Social history is interesting to me. Is the author’s name pronounced Rib sin ski ? I think so. I told my Latin teacher (of Czech origin) about this book and asked him on the phone, after spelling it out, how to pronounce the name. Only one problem: I can’t remember the answer. Just googled “pronounce Rybczynski” and came up with this:Rybczynski (pronounced rib-CHIN-skee),There you have it! …which makes total sense when you look at the more common word, Czech. I recently received this book from PaperBackSwap (looks brand new, too!). It will be on my Winter Reading Challenge list.